800 km marked mountain bike trails and a total of 1,856 m² in the 3 provinces of Carinthia, Tirol and Salzburg – a real bikers paradise in the area surrounding the Smaragd-Hotel Tauernblick! Join hotel director Maria Innerhofer or her bike guide-colleagues Andrea and Gerlinde on an intensive bike ride. You can go for a bike ride 4 times a week with our hotel guides. Routes are customized to fit your needs and expert always stand aside. 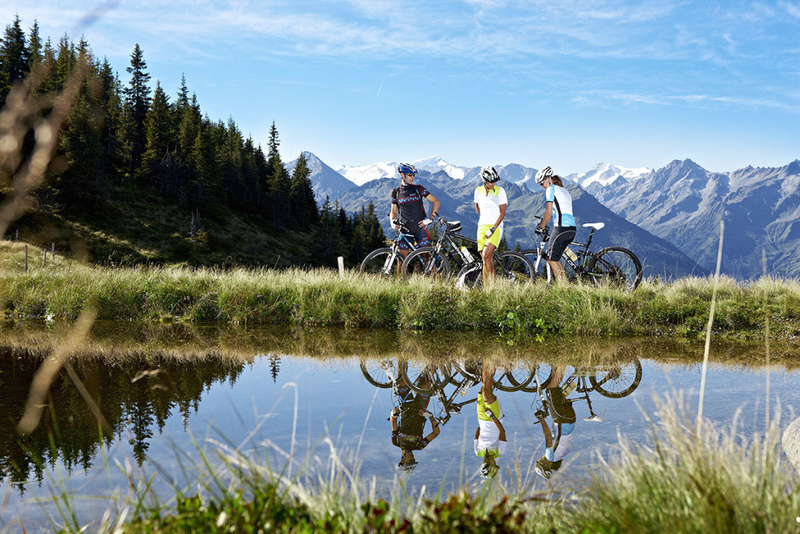 The Salzburg biking adventure will also be a blast for the new and inexperienced bikers! Choose between 2 different ability groups. Daily from 9am to 12pm you can bring your questions to the hotel director and certified mountain bike guide Maria Innerhofer, as well as to your other host Günter Innerhofer. Meet up in the evenings at the biker table to enjoy a refreshing drink with the local experts. Are you a bike newbie and want to get some experience? Then Hotel Tauernblick is the right place for you! At least 3 per week we offer the guided Easy-Tour. Some of our most popular rides are the panoramic tour with cable car transport, the pleasant ride to the Krimml waterfalls or a hut tour. Beginners can also try e-bikes to get started on their first kilometers (rental at the partner sport shops). More information on the respective routes can be found in our weekly program. The staff, certified bike guides hotel director Maria, Andrea and Gerlinde, can also answer your questions and advise you on your individual needs.